This paper introduces AcouMotion as a new hard-/software system for combining human body motion, tangible interfaces and sonification to a closed-loop human computer interface that allows non-visual motor control by using sonification (non-speech auditory displays) as major feedback channel. AcouMotion's main components are (i) a sensor device for measuring motion parameters (ii) a computer simulation to represent the dynamical evolution of a model world, and (iii) a sonification engine which generates an auditory representation of objects and any interactions in the model world. The intended applications of AcouMotion range from new kinds of sport games that can be played without visual displays and therefore may be particularly interesting for people with visual impairment to further applications in data mining, physiotherapy and cognitive research. The first application of AcouMotion presented in this paper is Blindminton, a sport game similar to Badminton which is particularly adapted to the abilities of people with visual impairment. 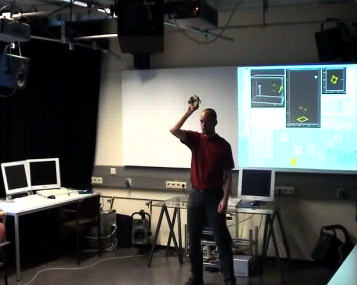 We describe our current system and its state of development, and we present first sound examples for interactive sonification using an early prototype. Finally, we discuss some interesting research directions based on the fact that AcouMotion binds auditory stimuli and body motion, and thus can represent a counterpart to the Eye-tracker device that exploits the binding of visual stimuli and eye-movement in cognitive research. Here we will provide sound examples and interaction video to demonstrate our current prototype of AcouMotion which is currently being developed to enable the sport game Blindminton for people with visual impairment. This is a video of our current One-player version of Blindminton, which might be called Blindhit. Sound Synthesis is implemented in SuperCollider.